Protea aurea subsp. potbergensis flowers in early winter when little else is flowering in the garden. The flowers are large and planted en masse, create a spectacular tall shrubbery suited to the large-sized garden. Protea aurea subsp. potbergensis is a large shrub or small tree, up to 4 m tall. It is sparsely branched and has an upright habit. The bark is smooth. Leaves are ovate to broadly ovate and heart-shaped at the base. They are grey-green and are soft and velvety when young. After a year, the leaves lose the velvety hairs, becoming smooth and hard. The margins of the leaf are fringed with fine hairs. Towards the base of the branch, leaves measure 60-90 x 45-65 mm, they decrease in size moving up the branch and measure 35 x 25 mm just below the flower head. Solitary flowers bloom at the tips of branches. Flowering occurs between April and July with the peak in May and June. Flower heads measure 90-130 mm long and have a broadly obconical shape when open. The flowers are slightly larger than those of P. aurea subsp. aurea. Buds are cylindrical when tightly closed and resemble a candle. Involucral bracts are cream-coloured at the tip of the flower changing to green-brown at the base of the flower. When the bud begins to open, the involucral bracts expand outwards and on ageing, bend downwards. This exposes the flowers which remain erect. Once the flowers have been pollinated, the flower head turns brown and closes. The seeds ripen and are stored on the plant within the flower head. The hairy nut seeds take about one year to ripen before they can be harvested. Protea aurea subsp. potbergensis is listed as Near Threatened on the current Red Data List (Raimondo et al. in prep.). Protea aurea subsp. potbergensis has a very small distribution range and is found only on the upper slopes of the Potberg, which is a small mountain at a height of 611 m and is found near Bredasdorp in the southern Cape. This protea grows in dense stands in sandy soils at an altitude of 200-360 m.
Linnaeus named this genus in 1735 after Proteus, a god in Greek mythology. This god was able to transform himself into many different forms, not unlike the many different forms of proteas. The specific name, aurea, means golden and it is thought that this name was given in error after seeing a dried herbarium specimen, as the flower heads fade to a dull yellow when dry. Potbergensis means belonging to the Potberg. P. aurea subsp. potbergensis was discovered in October 1940 by Mr N.S. Pillans. It was not found again until December 1965 when Dr J.P. Rourke and Dr I. Williams relocated it while collecting on the southern Potberg. There are 114 members in the genus Protea, 82 of which are found in South Africa ; 13 of these are from the summer rainfall region, but the majority (69 species); occur within the winter rainfall region. Protea aurea subsp. potbergensis is serotinous. 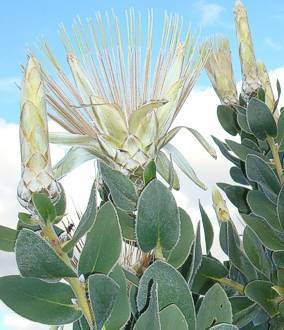 This means that the seeds are held within the dried flower heads on the plant for long periods of time. This protects the seed from being eaten by animals. When there is a fire, the mother plant is killed and this is when the flower heads burst open and release the seeds. The seeds fall to the ground and germinate prolifically after the first winter rains. The f lowers are pollinated by birds. During the first year, leaves are densely covered with soft, velvety hairs. This is to protect the delicate soft leaves from drying out in the sun and from being eaten by predators. After the first year, the leaves harden and develop a waxy coating. The hairs disappear and a smooth leaf surface remains. This subspecies is not widely used in the ornamental industry although many hybrids have been produced from Protea aurea subsp. aurea. 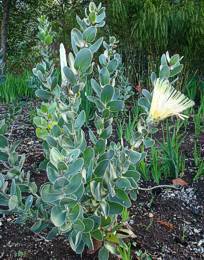 It is a plant that provides year round interest in the garden whether it is the velvety new leaves or large flowers that are on display. Protea aurea subsp. potbergensis is an easy to grow protea that adapts to a wide range of garden conditions. It is very fast growing when young and can reach a height of 3 m in four years. This rapid growth can cause the plants to become leggy, so regular pruning is necessary. Prune the current season's growth directly after flowering; this will produce a more compact, attractive shrub as well as prolonging the life of the protea. Proteas are not long-lived plants and will need to be replaced after about 8-10 years. The best time to plant is just before the rainy season. This enables plants to establish themselves and send down deep roots before the hot, dry, summer season. Protea aurea subsp. potbergensis requires a sunny situation with well-drained soil. In nature the plants grow together in large groups. One can imitate this in the garden by making an informal dense shrubbery that will create a spectacle of cream-coloured flowers in early winter. 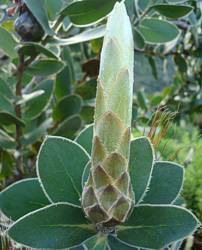 One can also create a mixed shrubbery using plants from the same habitat as P. aurea subsp. 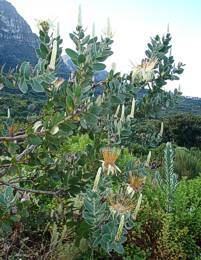 potbergensis, such as Thamnochortus insignis, Aulax umbellata, Artemisia afra, Metalasia densa, Berzelia abrotanoides, Erica mammosa, Polygala myrtifolia, Leucadendron laureolum, Mimetes cucullatus and Phylica pubescens. Propagate Protea aurea subsp. potbergensis from cuttings or seed. Seed has a much higher success rate than cuttings. Sow seeds in autumn when the nights are cool and the days warm. Treat the seeds with a systemic fungicide and plant in situ, open beds or in seedling trays. Use a well-drained fynbos mix consisting of 1 part loam, 1 part bark, and 2 parts sand. Cover the seeds lightly with sand or fine bark. This species germinates easily after ± 25 days, after which they grow rapidly. Once two true leaves have grown, prick the seedlings out into small bags. Place the seedlings in a lightly shaded area with good air circulation. When plants are ± 50-100 mm tall or after one year's growth, they can be planted into the garden. Nipping out the tips of the seedlings will encourage branching and produce a neater shrub. Protea seeds planted in situ generally grow faster and are less susceptible to diseases than those grown in a nursery situation. Take cuttings from the current season's growth in autumn or spring. The semi-hardwood cuttings should be 60-100 mm long. Dip the cuttings into a rooting hormone and plant in a mixture of 50 % polystyrene and 50 % bark. Place the cuttings under intermittent mist with a bottom heat of 25°C and good air circulation. Once the roots are well developed, remove from the mist unit and harden off for three weeks. Plant the cuttings into small bags and grow on until ready to plant into the garden. Protea aurea subsp. 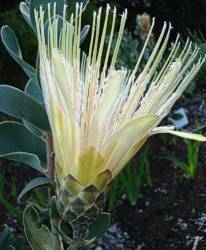 potbergensis is a relatively hardy protea and not susceptible to too many diseases and pests in a garden situation. The most important factor in preventing disease in proteas is to make sure the environmental conditions are correct. This includes getting direct sunlight for the most of the day, a well-drained soil where the soil does not stay saturated and stagnate, and good air circulation ensuring that the above-ground parts of the plant dry quickly after watering. It is also important to ensure that the soil stays cool in the hot months and roots are not disturbed by excessive digging. A thick layer of mulch or groundcover planting can be used to keep the soil cool and prevent moisture loss. If any of these factors are not correct, the plants become weakened and stressed and you will be sure to attract some form of pest or disease. 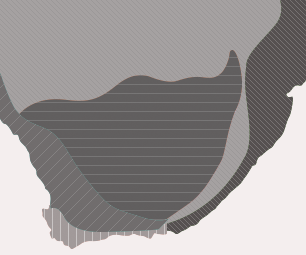 website: Protea Atlas Project. http://protea.worldonline.co.za.